Nothing demonstrates the good-natured intensity of the sporting rivalry between Australia and New Zealand more perfectly than the NRL Auckland Nines. It’s a rugby league tournament hosted annually in Auckland by the New Zealand Warriors, but they are the only Kiwi team in the NRL, so their 15 opponents are all Australian teams. Nevertheless, the feast of nine-a-side rugby league that results makes the trek across the Tasman Sea worth the effort, for players as well as punters. For punters, of course, the trek is purely metaphorical, because they can enjoy all the action at home via online betting sites. Australian betting fans will be looking forward to the weekend of February 04-05, when it all goes down at Eden Park. The Warriors will be champing at the bit this year. After seeing off 14 Australian sides in 2016, they went down to the Parramatta Eels 22-4 in the final. Then the Eels were stripped of the title for a salary-cap infringement, but the NRL decided to withhold the title rather than pass it on to the runners-up. So you might consider a punt on injured pride taking the Warriors all the way this year; at $4.50, the bookies seem to agree. 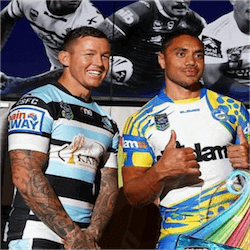 The Warriors might have home-ground advantage and the talent of phenomenal league player Shaun Johnson, and even the celebrity services of boxing heavyweight champ Joseph Parker as their water boy, but the Auckland Nines weekend won’t be plain sailing. The Warriors are in the same Piha Pool as the Eels, who are currently third-favourites at $9.00, and 2014 championship winners the North Queensland Cowboys, in the Hunua Pool, will also provide a strong challenge, given their second-favourite status at $8.00. And don’t rule out the Gold Coast Titans in the Waiheke Pool, currently joint third-favourites with the Eels at $9.00. Superstar Jarryd Hayne was a major feature in the Eels team for three years, so he will be keen to maintain that record in his new home, after switching to the Titans last year.